The light-year is a unit of length used to express astronomical distances and measures about 9.46 trillion kilometres (9.46 x 1012 km) or 5.88 trillion miles (5.88 x 1012 mi). [note 1] As defined by the International Astronomical Union (IAU), a light-year is the distance that light travels in vacuum in one Julian year (365.25 days). Because it includes the word "year", the term light-year is sometimes misinterpreted as a unit of time. The kilometre, or kilometer is a unit of length in the metric system, equal to one thousand metres. It is now the measurement unit used officially for expressing distances between geographical places on land in most of the world; notable exceptions are the United States and the road network of the United Kingdom where the statute mile is the official unit used. Popular science is an interpretation of science intended for a general audience. While science journalism focuses on recent scientific developments, popular science is more broad-ranging. It may be written by professional science journalists or by scientists themselves. It is presented in many forms, including books, film and television documentaries, magazine articles, and web pages. Astrometry is the branch of astronomy that involves precise measurements of the positions and movements of stars and other celestial bodies. The information obtained by astrometric measurements provides information on the kinematics and physical origin of the Solar System and our galaxy, the Milky Way. As defined by the IAU, the light-year is the product of the Julian year [note 2] (365.25 days as opposed to the 365.2425-day Gregorian year) and the speed of light (7008299792458000000♠299792458 m/s). [note 3] Both of these values are included in the IAU (1976) System of Astronomical Constants, used since 1984. From this, the following conversions can be derived. The IAU recognized abbreviation for light-year is ly,  although other standards like ISO 80000 use "l.y." and localized symbols are frequent, such as "al" in French (from année-lumière) and Spanish (from año luz), "Lj" in German (from Lichtjahr), etc. An astronomical constant is a physical constant used in astronomy. Formal sets of constants, along with recommended values, have been defined by the International Astronomical Union (IAU) several times: in 1964 and in 1976. In 2009 the IAU adopted a new current set, and recognizing that new observations and techniques continuously provide better values for these constants, they decided to not fix these values, but have the Working Group on Numerical Standards continuously maintain a set of Current Best Estimates. The set of constants is widely reproduced in publications such as the Astronomical Almanac of the United States Naval Observatory and HM Nautical Almanac Office. Simon Newcomb was a Canadian–American astronomer, applied mathematician and autodidactic polymath, who was Professor of Mathematics in the U.S. Navy and at Johns Hopkins. Clabon Walter (Cla) Allen FRAS, was an Australian astronomer, director of the University of London Observatory and author of Astrophysical Quantities. Other high-precision values are not derived from a coherent IAU system. A value of 7015946053620700000♠9.460536207×1015 m found in some modern sources   is the product of a mean Gregorian year (365.2425 days or 7007315569520000000♠31556952 s) and the defined speed of light (7008299792458000000♠299792458 m/s). Another value, 7015946052840500000♠9.460528405×1015 m,   is the product of the J1900.0 mean tropical year and the defined speed of light. The light-year unit appeared a few years after the first successful measurement of the distance to a star other than the Sun, by Friedrich Bessel in 1838. The star was 61 Cygni, and he used a 6.2-inch (160 mm) heliometer designed by Joseph von Fraunhofer. The largest unit for expressing distances across space at that time was the astronomical unit, equal to the radius of the Earth's orbit (7011150000000000000♠1.50×108 km or 7011149668992000000♠9.30×107 mi). In those terms, trigonometric calculations based on 61 Cygni's parallax of 0.314 arcseconds, showed the distance to the star to be 7005660000000000000♠660000 astronomical units (7016990000000000000♠9.9×1013 km or 7016981699840000000♠6.1×1013 mi). Bessel added that light employs 10.3 years to traverse this distance. He recognized that his readers would enjoy the mental picture of the approximate transit time for light, but he refrained from using the light-year as a unit. He may have resented expressing distances in light-years because it would deteriorate the accuracy of his parallax data due to multiplying with the uncertain parameter of the speed of light. The light-year unit appeared, however, in 1851 in a German popular astronomical article by Otto Ule. The paradox of a distance unit name ending on "year" was explained by Ule by comparing it to a hiking road hour (Wegstunde). ↑ The speed of light is precisely 7008299792458000000♠299792458 m/s by definition of the metre. The astronomical unit is a unit of length, roughly the distance from Earth to the Sun. However, that distance varies as Earth orbits the Sun, from a maximum (aphelion) to a minimum (perihelion) and back again once a year. Originally conceived as the average of Earth's aphelion and perihelion, since 2012 it has been defined as exactly 149597870700 metres, or about 150 million kilometres. The astronomical unit is used primarily for measuring distances within the Solar System or around other stars. It is also a fundamental component in the definition of another unit of astronomical length, the parsec. The parsec (symbol: pc) is a unit of length used to measure large distances to astronomical objects outside the Solar System. 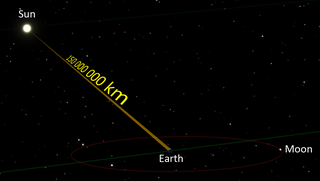 A parsec is defined as the distance at which one astronomical unit subtends an angle of one arcsecond, which corresponds to 648000/π astronomical units. One parsec is equal to about 3.26 light-years or 31 trillion kilometres (31×1012 km) or 19 trillion miles (19×1012 mi). The nearest star, Proxima Centauri, is about 1.3 parsecs (4.2 light-years) from the Sun. Most of the stars visible to the unaided eye in the night sky are within 500 parsecs of the Sun. The speed of light in vacuum, commonly denoted c, is a universal physical constant important in many areas of physics. Its exact value is 299,792,458 metres per second. It is exact because by international agreement a metre is defined as the length of the path travelled by light in vacuum during a time interval of 1/299792458 second. According to special relativity, c is the maximum speed at which all conventional matter and hence all known forms of information in the universe can travel. Though this speed is most commonly associated with light, it is in fact the speed at which all massless particles and changes of the associated fields travel in vacuum. Such particles and waves travel at c regardless of the motion of the source or the inertial reference frame of the observer. In the special and general theories of relativity, c interrelates space and time, and also appears in the famous equation of mass–energy equivalence E = mc2. Albireo is the traditional name for the double star also designated Beta Cygni, although the International Astronomical Union now regards the name as only applying to the brightest component. Although designated 'beta', it is fainter than Gamma Cygni, Delta Cygni, and Epsilon Cygni and is the fifth-brightest point of light in the constellation of Cygnus. Appearing to the naked eye to be a single star of magnitude 3, viewing through even a low-magnification telescope resolves it into its two components. The brighter yellow star makes a striking colour contrast with its fainter blue companion. The astronomical system of units, formally called the IAU (1976) System of Astronomical Constants, is a system of measurement developed for use in astronomy. It was adopted by the International Astronomical Union (IAU) in 1976, and has been significantly updated in 1994 and 2009. Centaurus A or NGC 5128 is a galaxy in the constellation of Centaurus. It was discovered in 1826 by Scottish astronomer James Dunlop from his home in Parramatta, in New South Wales, Australia. There is considerable debate in the literature regarding the galaxy's fundamental properties such as its Hubble type and distance. NGC 5128 is one of the closest radio galaxies to Earth, so its active galactic nucleus has been extensively studied by professional astronomers. 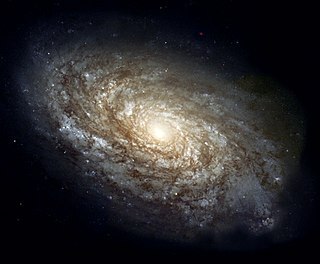 The galaxy is also the fifth-brightest in the sky, making it an ideal amateur astronomy target, although the galaxy is only visible from low northern latitudes and the southern hemisphere. Messier 32 is a dwarf "early-type" galaxy located about 2.65 million light-years from Earth, appearing in the constellation Andromeda. 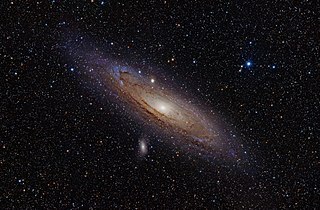 M32 is a satellite galaxy of the Andromeda Galaxy (M31) and was discovered by Guillaume Le Gentil in 1749. M32 measures 6.5 ± 0.2 thousand light-years in diameter at the widest point. Messier 106 is an intermediate spiral galaxy in the constellation Canes Venatici. It was discovered by Pierre Méchain in 1781. M106 is at a distance of about 22 to 25 million light-years away from Earth. M106 contains an active nucleus classified as a Type 2 Seyfert, and the presence of a central supermassive black hole has been demonstrated from radio-wavelength observations of the rotation of a disk of molecular gas orbiting within the inner light-year around the black hole. NGC 4217 is a possible companion galaxy of Messier 106. A Type II supernova was observed in M106 in May 2014. 53 Arietis is a variable star in the northern constellation of Aries. 53 Arietis is the Flamsteed designation; it also bears the variable star designation UW Arietis. It is a B-type main sequence star with a stellar classification of B1.5 V and mean apparent magnitude of 6.10, which is near the lower limit for naked eye visibility. Based upon an annual parallax shift of 3.92 mas, the estimated distance to this star is roughly 800 light-years. Theta Cygni is a star in the northern constellation of Cygnus. It has an apparent visual magnitude of 4.5, so it can be seen from the northern hemisphere with the naked eye in sufficiently dark skies. Based upon parallax measurements, it is at a distance of about 59.8 light-years from the Earth. It is suspected of hosting an extrasolar planet. SS Cygni is a variable star in the northern constellation Cygnus. It is the prototype of the subclass of dwarf novae that show only normal eruptions. It typically rises from 12th magnitude to 8th magnitude for 1–2 days every 7 or 8 weeks. 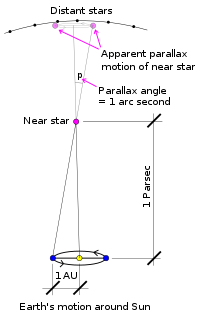 The northerly declination of SS Cygni makes the star almost circumpolar from European and North American latitudes, allowing a large proportion of the world's amateur astronomers to monitor its behavior. Furthermore, since the star lies against the rich backdrop of the Milky Way band, the telescope field of view around SS Cygni contains an abundance of useful brightness comparison stars. NML Cygni or V1489 Cygni is a red hypergiant (RHG) or red supergiant (RSG) in the constellation Cygnus. It is one of the largest stars currently known, and is also one of the most luminous and massive cool hypergiants, as well as one of the most luminous stars in the Milky Way. If placed at the center of the Solar System, its surface would extend past the orbit of Jupiter or Saturn. ↑ "Selected Astronomical Constants" in Astronomical Almanac , p. 6. ↑ Bessel, Friedrich (1839). "On the parallax of the star 61 Cygni". London and Edinburgh Philosophical Magazine and Journal of Science. 14: 68–72. Retrieved 4 April 2014. Bessel's statement that light employs 10.3 years to traverse the distance. ↑ Ule, Otto (1851). "Was wir in den Sternen lesen". Deutsches Museum: Zeitschrift für Literatur, Kunst und Öffentliches Leben. 1: 721–738. Retrieved 4 April 2014. ↑ Diesterweg, Adolph Wilhelm (1855). Populäre Himmelskunde u. astronomische Geographie. p. 250. ↑ The Student and Intellectual Observer of Science, Literature and Art. 1868. Retrieved 1 November 2014. ↑ "Stellar movements and the structure of the universe" . Retrieved 1 November 2014. ↑ "Tau Ceti's planets nearest around single, Sun-like star". BBC News. 19 December 2012. Retrieved 1 November 2014. ↑ Tuomi, Mikko; Jones, Hugh R. A.; Jenkins, James S.; Tinney, Chris G.; Butler, R. Paul; Vogt, Steve S.; Barnes, John R.; Wittenmyer, Robert A.; O'Toole, Simon; Horner, Jonathan; Bailey, Jeremy; Carter, Brad D.; Wright, Duncan J.; Salter, Graeme S.; Pinfield, David (March 2013). "Signals embedded in the radial velocity noise: periodic variations in the τ Ceti velocities" (PDF). Astronomy & Astrophysics. 551: A79. arXiv: 1212.4277 . Bibcode:2013A&A...551A..79T. doi:10.1051/0004-6361/201220509. ↑ Light-Travel Time and Distance by the Hayden Planetarium Accessed October 2010. ↑ David Mermin (2009). It's About Time: Understanding Einstein's Relativity. Princeton, New Jersey: Princeton University Press. p. 22. ISBN 978-0-691-14127-5.